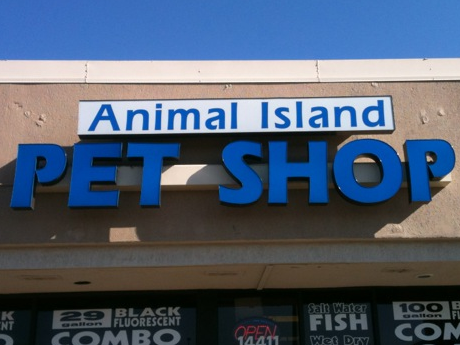 Animal Island Pet Store is a family owned local business in Midlothian IL. Our family has been in the pet store business for over 42 years specializing in tropical fish, reptiles and small animals. Dave and Jason, father and son, are the owners of Animal Island and Kristie, Dave's daughter, is the store manager. As we said, Animal Island Pets is a family owned, old fashion style pet shop. Unlike the superstore pet centers, we are a boutique shop where our friendly and knowledgeable staff members are available to help you select just the right fish, reptile or small animal. We can help you with buying your pet or fish, setting up your aquarium or reptile tank, creating a safe habitat for your small animal, maintaining your pets in a healthy environment, and solving any problems that come up. We specialize in tropical fish from around the world with an extensive collection of African Cichlids. Our selection of tropical fish spans the globe: Central and South America, Africa, the Far East, Asia, Australia, and North America. Our reptile section has a variety of common and exotic snakes, lizards, turtles and frogs that are suitable to keep in captivity. Our small animal section has guinea pigs, rabbits, ferrets and chinchillas. Our staff can help select the small animal that will fit you or your child. We stock an assortment of cages and tanks for all of our animals and fish. Our selection of food, both live and packaged is fresh and of top quality to make sure your pet’s health and nutrition needs are properly taken care of. Our live food section has a wide variety of feeder fish, such as minnows, rosies, goldfish, guppies, and ghost shrimp, and 3 sizes of crickets. We have large varieties of worms, for example: earthworms, wax worms, black worms and several others types. We also have feeder mice and three sizes of rats for reptiles. We welcome you to stop in and visit our shop or call 708-293-0600 for information. If you would like getting more information on sales, events and newsletters from Animal Island Pets, please use our subscribe link and enter your name and email. After you subscribe on our newletter and events tab, please accept our next two emails before deciding to unsubscribe.